Our Abpromise guarantee covers the use of ab7004 in the following tested applications. As a general guideline, dilutions of 1/50 to 1/200 should be suitable for most applications. Flow Cyt 1/100 - 1/250. The maximum amount of reagent required to stain 1 x 106 cells in flow cytometry is approximately 1.0µg of antibody conjugate. Lesser amounts of reagent may be sufficient for staining. Load: 100 ng, 33.3 ng, 11.1 ng, 3.7 ng, or 1.23 ng as indicated. Secondary antibody: ab7004 at 1:1,000 for 60 min at RT. Block: Blocking Buffer for Fluorescent Western Blotting for 60 min at RT. Very bright secondary antibody and PE is one of the best if you have a weak antigen. I used this in a perfect pairing with FITC in a FACS experiment to check pluripotency markers in human embryonic stem cells. Publishing research using ab7004? Please let us know so that we can cite the reference in this datasheet. I need to know cross-reactivity for ab7004 (anti-goat IgG). Specialy-does the antibody react with swine (pig). Thanks for you time. Thank you for your enquiry. No reaction was observed with ab7004 against ant-Pepsin, anti-Donkey IgG F(c), Chicken, Guinea Pig, Syrian Hamster, Horse, Human, Mouse, Rabbit, or Rat serum proteins or other goat heavy or light chain proteins. Pig was not tested. If you have any further questions, please contact us again. I read the datasheet and indeed I saw that the ab was tested for FACS. However I wondered whether it also was tested for INTRACELLULAR FACS. Because this procedure gives more problems with aspecific signals than normal FACS (extracellular) stainings. Thank you for your reply. Generally, if you intend to detect an intracellular protein via FACS analysis, you need to permeabilise the cells (i.e. using permeabilization buffer containing saponin) before the staining procedure. This secondary antibody should be suitable for recognizing both intracellular and extracellular epitopes. However, you must check the suitability of the primary antibody as well. Make sure that the primary and the secondary are compatible with each other and they both have been tested for FACS analysis. PRE-SALES ENQUIRY Is the antibody also tested for intracellular staining (as sec ab) by means of flowcytometry? And do you have a protocol for this application? Thank you for your enquiry and your interest in our products. 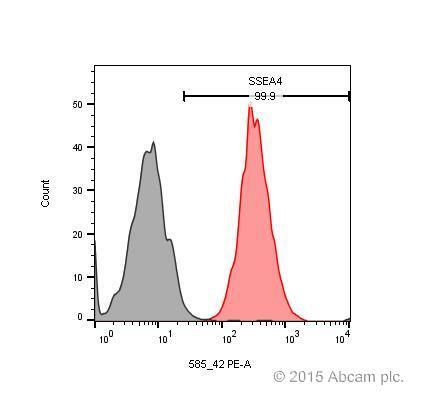 According to the datasheet, this secondary antibody (ab7004) has been tested for FACS/Flow cytometry. For details on general FACS analysis, please click on the “Protocols“ section on the right hand side panel of the Abcam homepage, you might find some useful information there. We do not have a concentration for the antibody as such. However, the concentration of the label is 0.5 mg/ml, and we would estimate the antibody to be about 1 mg/ml.